Ten Weeks to the Brexit Cliff | What's that you said? Dang, y’all have less than ten weeks to avoid falling off the Hard Brexit scenario. I know you do your national elections in like six weeks, but do y’all have enough time here to agree to another referendum or what? But her failure to convey any convincing vision of Britain’s future outside the European Union has allowed painful divisions in the country to deepen. And it has created a risk that Britain will exit the 28-nation European bloc with no deal, which analysts have warned could tip Britain into recession and trigger shortages of food, medicine and electricity because of constraints on trade. I still don’t understand how May’s plan (or any plan) goes into effect without EU’s signoff on it: from my understanding, they haven’t indicated approval of any of the plans presented to them thus far. So even if she’d survived this vote, would that plan have actually happened? Mrs. May’s plan would ultimately have given Britain’s government power over immigration from Europe, and would have kept Britain in the European Union’s customs and trade system until at least the end of 2020 while a long-term pact is negotiated. Didn’t she just survive a no-confidence vote that gave her a year of breathing room? Or was that a Tory-only no-confidence and this is now a Parliament-wide one? 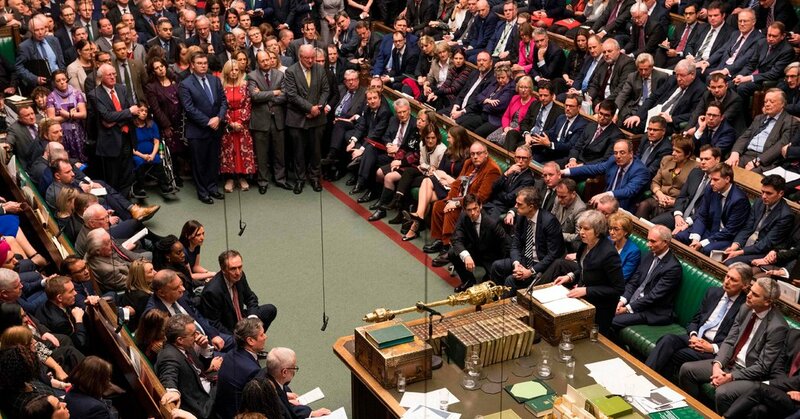 Immediately after the vote against her proposal, the Labour Party leader, Jeremy Corbyn, citing the “sheer incompetence of this government,” called for a vote of no confidence in Mrs. May, which will be debated on Wednesday. The 230-vote margin was the largest in Parliament in recent British history and sends the country into uncharted waters. This entry was posted in The Global Picture and tagged brexit, britain, politics, teresa_may. Bookmark the permalink.